The sustainable seafood dinner is served with a unique view, 5 metres below the surface in Europe's first underwater restaurant, which has just opened in Norway with more than 7,000 customers booked in to eat among the fish. It is called Under, which also means "wonder" in Norwegian. It was designed by Norwegian architecture firm Snoehetta, which also created the Opera house in Oslo and the National September 11 Memorial Museum in New York. Situated on the southern tip of Norway, the restaurant looks like a large concrete tube partly submerged in the North Sea. Entering Under initially feels like going into a sauna, as wooden planks cover its upper section, but an eight-metre flight of stairs leads down to a large dining area, walled by a gigantic transparent window to the ocean. 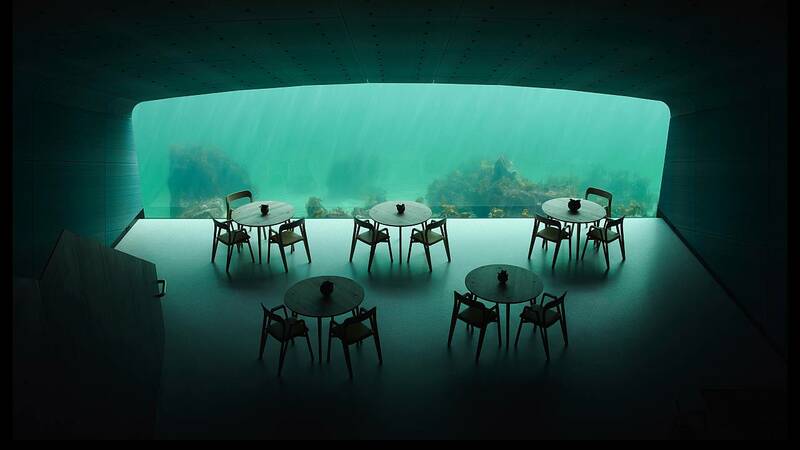 The restaurant seats 35-40 dinner guests every night, in a dining room protected by half a meter-thick concrete walls. The menu is based on locally-sourced produce, with a special emphasis on sustainable wildlife capture. Click on the video above to take a look inside the newly opened restaurant and research centre.